Explanation: Star trails streak this composite time exposure of comet Tempel-Tuttle recorded by Tim Puckett on January 26, 1998. Then passing through the inner solar system on its 33 year orbit around the Sun, Tempel-Tuttle brightened unexpectedly, but binoculars or small telescopes were still required to visually observe it. 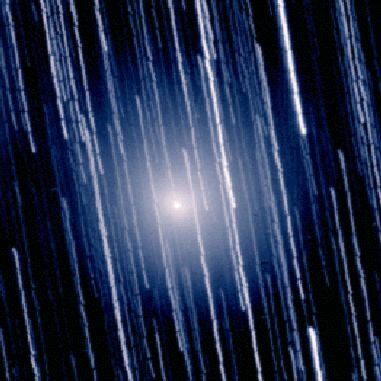 Tempel-Tuttle is also called "the Leonid Comet" as the yearly Leonid meteor shower results when the Earth crosses this comet's orbital plane and encounters a trail of cometary dust. So, while not rivaling spectacular naked-eye comets like Hyakutake or Hale-Bopp, Tempel-Tuttle still puts on a show. The Earth is now approaching relatively dense regions of Tempel-Tuttle's orbiting debris trail, so in the next few days, skywatchers will be searching for leonid meteors. An extremely active meteor shower is expected to be visible over Europe and North America in the early morning hours of Tuesday, November 19, despite interference from a glaring full moon.